Do your dust mite allergy symptoms include itchy skin? Are you wondering “Can I get a rash from dust mites”? If so, you’ve come to the right place. In this article I’ll discuss one of the main dust mite allergy symptoms, itchy skin. I’ll share what makes us itch and the type of rash (often eczema). Many people are confused about the rash dust mites cause and confuse it with a bite mark made by another arachnid. I’ll share the most common places dust mites live and why their location in our homes make us prone to itchy skin. Lastly I’ll share a few tricks to help manage the symptoms and reduce dust mite presence in your home. These tips include dust mite proof bed protectors, HEPA air purifiers, HVAC allergy filters, and soothing lotion that is unscented or completely natural. Let’s get started! Looking back, I should have known I was allergic to dust mites. I can remember laying on a couch and impulsively itching my neck, legs, arms. The areas on my body that were in direct contact with the couch developed small rashes. These would come and go throughout the years and I’d wonder why it was happening. The rashes were small and red. As I itched my skin they would slowly grow in size. After a few hours or days, the rashes would stop itching and subside. There were times, however, when the rashes were constantly on my body. I eventually realized that my bed was the main source of dust mites..and of course, I slept in my bed every single night. When I went to bed at night I would feel great, yet every morning I would wake up tired with itchy arms and legs. I had a chronic cough, my sinuses would be congested, my eyes would itch along with the corners of my mouth. I constantly had watery eyes. Years later I would visit an allergist and be tested for dust mites. The tests would come back positive and I’d finally have some understanding about why I was always itchy. If you have the dust mite allergy symptom of itchy skin, hopefully, you can discern the cause before I did (it took me 20 years!). The reason it took so long is that we can’t feel dust mites on our skin, nor can we see them. Once you confirm your dust mite allergy there are a number of natural steps you can take for relief! Note: Dust mites live in the majority of homes across America. They are microscopic creatures, invisible to our eyes, and they feed on our waste (dead, shed skin). Many symptoms begin to emerge in childhood. Some children will outgrow their allergies as they develop. For others, the allergies can snowball if not treated and become worse over time. As adults, allergies can also emerge, sometimes naturally or due to stressful periods in life. With your dust mite allergy, you may have itchy skin or you may have itchy skin with rashes. At different periods of my life I have various symptoms. Almost always, my skin is dry and itchy. I hydrate routinely and take good care of my skin (my best tips to reduce eczema caused by allergies). There are times when my dry skin + itching turns into a rash. I develop rashes only when I’m having severe allergies and this largely depends on the time or year or where I’m sleeping (visiting family, on vacation etc.). Today we’ll discuss the symptom of itchy skin, what it looks like, how it feels, and what you can do to protect yourself. Some, but not all people who have allergies, have allergic eczema. Allergic eczema, also called contact dermatitis is a skin reaction to environmental allergens or irritants. The skin barrier is weaker than most people, lacking filaggrin, making it susceptible to irritation and bacterial infections. Do you get itchy in bed and wake up with rashes around your eyes, mouth, arms or legs? 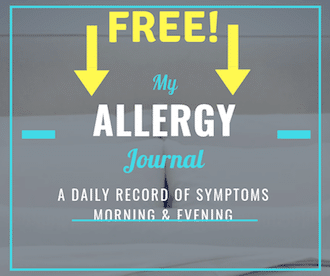 Do you feel itchy symptoms when resting on a fabric couch? Do you feel itchy symptoms when laying on the carpet? When a fan or A/C is blowing do your eyes water or ears, nose, throat begin to itch? The beds, couches, and carpets tend to have the most dust mites and direct contact with your body could result in an allergic rash. It’s important to note, that unlike pollen, dust mites aren’t a seasonal allergen. If you have symptoms they will likely be year-round. Year-round symptoms are what distinguish dust mites from the other common allergens (mold, pollen). In my case, eczema rashes were almost constant. I thought eczema and allergies were a separate issue so I never considered they might be connected. It wasn’t until I visited my allergist did he mention that allergens can cause eczema to flare, especially if I was allergic to pollens, cats/dogs, and dust mites. After being tested, my allergist recommended I take a daily anti-histamine called Allegra but also said I should take a few steps to minimize dust mite exposure and reduce my chances of getting rashes. These were relatively simple and inexpensive tips. Some of his tips are listed below. I always take short, mild temperature baths or showers and dry lightly with a towel (dabbing/padding not rubbing). My allergist suggested baths were better for skin than showers because they don’t wash all the beneficial oils off your skin. After bathing I immediately moisturizing to lock in moisture. Doing so helps reduce dry itchy skin caused by dust mites. I was recommended and now only use Cetaphil (check price) lotion. It’s non-scented and non-greasy, making it the No. 1 recommendation for people suffering from eczema rashes (check Cetaphil price on Amazon). Of course, you can use another non-irritating emollient that suits your skin. A hydrating lotion will help add a layer of protection for your skin as cracked, dry skin will be more reactive to dust mites and other allergens. Coconut oil is natural and a light oil great for rehydration and moisturizing. Men and women can apply a small amount before bed and skin will be silky smooth. Be sure to rub in well and let soak in before laying on your pillow (check coconut oil on Amazon). Grapeseed oil is another miracle oil for natural moisturizing. I’ve used it around my eyes for years. The skin around the eyes is thin and chemical lotions can quickly absorb into the skin. I don’t know the long term implications for using synthetic ingredients on sensitive areas of my body and prefer something natural like grapeseed oil. I like that it is a light oil full of antioxidants and fatty acids. It also rubs in well and won’t be too greasy (check Grapeseed Oil on Amazon). This helped me the most since I had severe dust mite allergies and it helped reduce my itchy skin while sleeping! 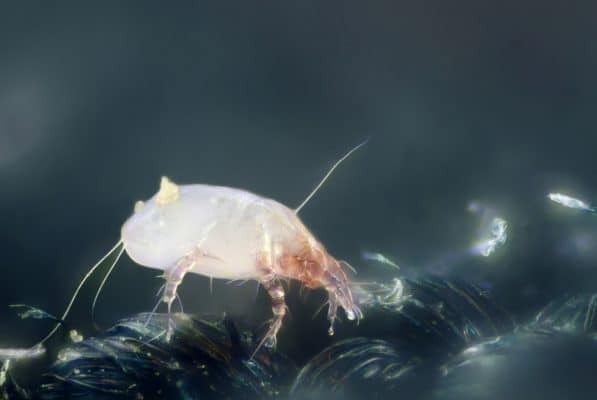 Dust mite covers are a secret for clean-freaks and those with itchy allergic symptoms. Whether you have allergy or not, bed covers drastically improve bedroom hygiene by limiting the amount of dust, dirt, and pillow feathers. Covers are available for pillows, mattresses, and blankets (these are the covers that worked best for my allergies). The dust mite proof covers don’t allow dust mites, animal dander, feathers, or dirt to pass through the fabric. Quality covers have ultra-fine stitching but are still breathable for a comfortable night’s sleep. Because of their ultra-tight weave, the covers prevent dust mites from coming in contact with you while you sleep and keeps them out of your mattress and pillows. Interesting fact: A 2-year old pillow could be made up of 10-15% dust mites and their feces. Isn’t this repulsive?! The great thing about dust mite covers is you don’t have to get rid of your favorite pillow. Simply put the old pillow inside the cover and dust mites are no longer an issue. Your colorful sheets and pillow covers will go over the dust mite cover. Covers only need to be washed 2-3 times a year, however, you will want to wash your regular sheets regularly. By regularly we mean 1 time per week. I suggest adding essential oil to your wash to make sure you kill all the dust mites and their larvae. Essential oils work great because they smell wonderful and bypass the need for super hot water to kill dust mites. There are a number of essential oils that work great for dust mites. Another helpful tip for the bedroom is to make a DIY Dust Mite Spray. These are 100% organic and freshen up the whole house! I use them in my room, on rugs, couches, my bed, and in my closet. HEPA vacuums stand for High-Efficiency Particulate Arrestance. HEPA vacuums pick up the smallest of particles from the air. Many new vacuums have HEPA filters, but older vacs just blow dust around, possibly making allergies worse! My favorite product for healthy indoor air is a HEPA air purifier. If you’re like me, you know that air purifiers aren’t always what they claim to be. In fact, I had an “air purifier” growing up and it did nothing! I remember seeing a small sponge-like filter on the back of the machine and thinking “what is this filter catching”. The answer was simple…not much. These days HEPA air purifiers are amazing and can remove the finest particulates from the air. The air purifiers we recommend catch gases and chemicals, odors, dander, pollen, dust, and dust mites. They can clean all the air in a room within a few hours and are meant to run 24 hours a day! One of my best recommendations is something you already have in your home or apartment. It’s an HVAC filter that you replace every 3-6 months. If you suspect you have dust mite allergy symptoms, you should consider the type of filter you are using. Filtrete is known for making the best air conditioning and heating filters on the market. Most people purchase the cheapest ones which don’t capture dust mites, only blow them around. Filtrete also offers thick, allergy control filters (these are my favorite HVAC allergy filters) that will reduce the pollution in your home. Heck, they even sell filters that capture odors, bacteria, and smoke (pretty amazing!). High-quality filters are a simple and effective solution to improve household air quality and reduce dust mites! Don’t forget to replace them every 3-6 months depending on their use. If you pair an HVAC filter with the air purifier mentioned above you will have fresh indoor air and much less dusting to do on the weekends. Dust mites love humidity. In fact, there are much fewer dust mites in the Western U.S. were it is more dry, especially in high elevation areas like Colorado. If you live in a humid region and have itchy skin when the weather is hot and humid, consider purchasing a dehumidifier. Ventilating the house and creating airflow is important to increase air circulation in the house. Opening window shades and allowing sunlight in a room will also help dry out a damp home environment. A dehumidifier in a basement can collect a lot of moisture in the summer months (my article on dehumidifiers for dust mite allergy). My sister, who lives in Washington installed a dehumidifier and collects a liter of water per day in her basement. She said it was a great investment! Carpeting not only captures dust, pollen, and dirt, it also makes a great home for dust mites where they can stay warm and hide. If you suspect you have severe dust mite allergies, consider removing carpeting and instead use hardwood, laminate, or tile flooring. It won’t be as soft for your feet, but hard flooring will be much less hospitable to dust mites and removes warm hiding spots. Itchy skin and eczema rashes are a common symptom of dust mite allergy. Even if you’re not allergic to dust mites, they can still be an irritant to dry skin. If you think you might be allergic to dust mites, be aware of how you feel when resting on the couch or carpet, or sleeping in bed. If these are itchy places, you might have an allergy. Finally, think about taking steps to improve your home environment. Start with the bed and get covers. Bed covers aren’t expensive, last decades if treated well, and can do wonders for your sleep. I have them on my entire family’s beds even though not everyone is bothered by them. It’s a hygienic thing to do! Also wash regularly and think about getting rid of carpeting. You can buy filters for your HVAC system that do a great job in removing dust mites, pollen, dander, odors, and smoke. If you think you’re having dust mite allergy symptoms and itchy skin, make sure you use a lotion that is non-irritating like Cetaphil. Apply the lotion a few times a day and your itchy skin won’t dry out. We hope you enjoyed this blog article on dust mite allergy symptoms and itchy skin. To read more posts and view our products, visit us at Dust Mite Solutions!